Free for a limited time. Normally a $5.99 value. As an independent author, you know how hard it can be to not only write amazing novels but also to take on the huge responsibilities of marketing and distribution. For many authors, this is a particularly difficult task because they have little to no marketing experience. 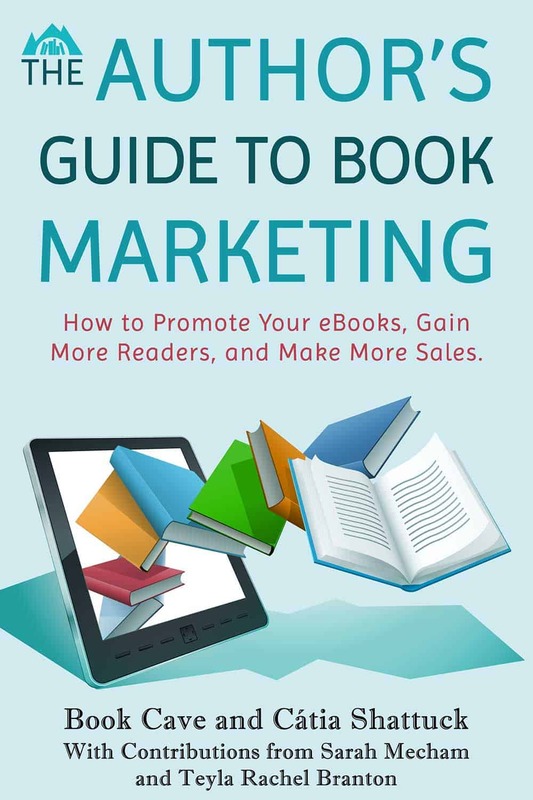 That is why we—an editor, an author, and a marketer—created this ebook with the marketing and promotional tactics that we’ve tested and discovered to be the most effective to help hard working authors like yourself sell more books. Author-editor Catia Shattuck, marketer Sarah Mecham, and author Teyla Rachel Branton have more than 40 years of combined years experience working with authors in the writing, marketing, and publishing arena. They founded Book Cave in order to share the techniques they’ve learned work best with authors on a larger scale. To date Book Cave has helped over 6,000 authors sell more books, and we'd love to help you too! Our goal at Book Cave is to connect the right readers with the right books, helping authors find new readers who will love their books while helping readers ensure that their to-be-read piles never run out. To make this possible, our avid readers are divided by genre and content rating, so we’re matching your book with readers who crave your particular content. We have thousands of active subscribers who love to receive our daily emails about free and discounted ebooks! That's right. They are eager to find new authors to read and follow. These are traditional promotions with the goal of getting more readers to download and read your books at a discounted or free price in the hopes that they will then go on to buy more of your books at full price. This single-book feature is the most immediate way to reach our avid subscribers and gain immediate downloads. We are big fans of authors helping authors. In a group retailer promotion, authors of a genre or style come together to create a landing page full of free and discounted ebooks in order to sell more of your books to readers that you already know are interested in your style of writing. The group landing page, created and hosted by Book Cave, is then shared with each of your fellow authors' email subscribers and social feeds, as well as promoted via Facebook ads, in emails by Book Cave, and more. Offer a free ebook or sample directly to readers when they sign up for your newsletter. Subscribers are thrilled to get a great book for free and often find authors they love this way. This gives you the chance to make a lifelong fan who will support your writing and buy more of your books! You can link to your personalized subscriber magnet page on your site, on social media, at the end of your books, and more, and you can use it to find subscribers or to distribute review copies. Subscriber magnet group promotions are where authors combine their free subscriber magnet ebooks of the same genre or style on one landing page. These group promotions are then shared across each author’s newsletter subscribers, social media, and on the Book Cave site. This is another great way to use your subscriber magnet to build your email list. We have a gorgeous author profile section where readers can choose to follow an author and be notified of their latest releases. Readers can browse the author profiles right on Book Cave's site. All submissions will also have a regular-priced, permanent listing on our book database, My Book Ratings, for additional exposure. To learn more about our author programs, sign up for our author newsletter. Plus, we’ll still send you a copy of our marketing ebook for free! I was skeptical, as always, but the number of free downloads my KDP dashboard was showing the next day was over 1.5k! . . . I am super impressed and very happy with the tiny amount I spent for running a book promo via Book Cave. I spent a great amount on another promo and got 3 downloads only. So please, everyone reading this review—Book Cave promo is tons better than many out there. [Book Cave] give(s) one of the best promotional packages. I kept track of the impact of all the different promotions I ran (and I used nearly everything besides BookBub), and your promo gave me a very good, legitimately positive ROI on a 0.99 cent promo. Just wanted to say, I love your service! You do a fantastic job. By far, either my #1 or #2 favorite promo business. As an indie author, Book Cave makes a huge difference in my book promotion strategy. Listing my book with them always results in plenty of downloads and sales—for a great price. Not only that, but their reader magnets and multi-author promotions have performed really well for me and other author buddies. Can't recommend them highly enough! Ready to receive your free ebook and start promoting?